The State Hermitage Museum has released two smartphone applications in Russian and English to help visitors navigate the museum without a guide. Other museums and parks are now following suit, including Moscow’s Pushkin Museum of Fine Arts. 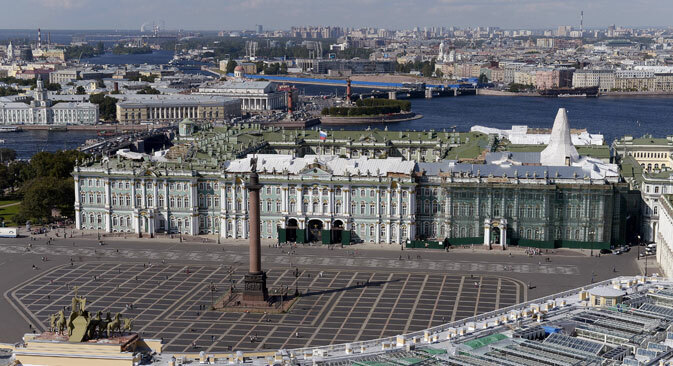 St. Petersburg’s State Hermitage Museum is leading the way into the 21st century for Russia’s museums with the release of two smartphone applications in Russian and English. Hermitage Museum and Audio-Guide to the Hermitage, as the new mobile apps are called, will allow visitors to properly tour the Hermitage without a guide. In addition, the apps should prevent patrons from getting lost — no mean feat in a museum with over 3 million items on display. The Hermitage Museumapp provides the user with the museum’s latest news and exhibition announcements, and allows them to build a personal catalog of their favorite artworks and museum pieces by saving digitized copies. Additional content such as educational lectures, themed excursions, and virtual tours can be downloaded free of charge or purchased using the Store section of the app. Add-ons, which range in price from 33 to 129 rubles ($0.90-$3.70), take the form of e-books in Russian or English, and there are currently more than ten to choose from (Rembrandt, Ancient Egypt, Biblical Topics, The Winter Palace of Peter I, and many more).. The app can provide directions to the Hermitage from your current location in St. Petersburg. In addition, it includes maps of the museum, so that smartphone users will not lose their way inside. Other useful features include reminders of museum hours and closing times. The app is a free download and is available for the iPad, iPhone, and Android. The second app, Audio-Guide to the Hermitage, was developed specifically for the iPhone. This program can just about replace a live tour guide, as the collection of interactive excursions is comprehensive. The only thing that may be lacking is personal contact with your guide. The Hermitage intends to solve the language problem, however. “Next winter new languages for the app will be introduced, in particular Chinese and other East Asian languages,” explains Maria Seklikova, lead specialist of the State Hermitage Computer Technology Sector. “In addition, the app will soon contain a more complete database of exhibits and offer more excursions. Currently, only the beta version of the app is available, as including all 3 million exhibits requires considerable time,” At the moment, the guided tours Hermitage in an Hour and Hermitage Overvieware available, at a price of 229 ($6.50) and 329 rubles ($9.40), respectively. Alongside other functions, the app can plot a course to any information desk, cafeteria, ATM, Wi-Fi zone, or other given point in the Hermitage, allowing easy navigation of the museum's 300-plus rooms. And most important of all, it can be downloaded free of charge. GPS technology has already been applied at the palace and park complex at Peterhof, assisting visitors with navigation in that museum. Peterhof's free iOS and Android apps present visitors with tour routes through the Upper Gardens and Lower Park, with descriptions of each important location in audio-guide format. A similar app has been released for Gorky Park, presenting users with daily program schedules, announcements for interesting events, photographs of the park, and an interactive map. The Pushkin Museum of Fine Arts is keeping pace with progress, as well, having released an app containing information on all its Italian paintings from the 8th-20th centuries. The app includes over 550 works of art and a chronological rundown of the entire period of development for one of Europe's leading schools of painting. Also covered is the history of the museum's collection of Italian masters and descriptions of the Italian school in each of its historical eras. The cost is 66 rubles ($1.90).